If you’re looking for a great granola without all of the sugar and added preservatives—make your own! This quick and easy recipe is full of nutritious ingredients without all the extra junk! 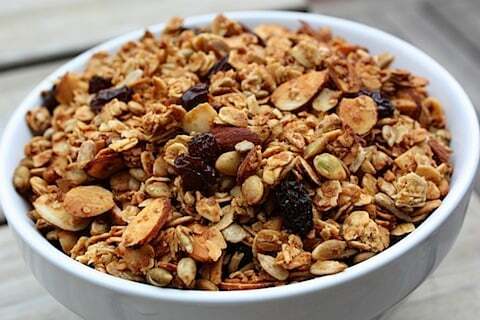 Best of all, granola is easy to modify. There really aren’t any hard and fast rules, so feel free be creative and swap out some of the ingredients! In a large bowl, mix together oats, cinnamon, coconut, along with the nuts and seeds. Heat coconut oil and honey in a small saucepan over medium heat until just melted but not hot. Remove from heat and add vanilla. Stir honey mixture into oat mixture. Pour into two large baking dishes and bake at 325 for 35-40 minutes or until oats are golden brown. Stir occasionally while cooking for even browning (keep an eye on them after 30 minutes because it can burn quickly). Remove from oven, and cool. Add raisins or dried fruit. Store in an airtight container. If you’d like to extend the life of the granola beyond a few weeks, store in the fridge.